Meet James Bigglesworth, wartime air ace and peacetime Sergeant in the Special Air Police, know to his friends and some of his enemies as 'Biggles'. Born in India in 1899 and in the mind of his author W.E. 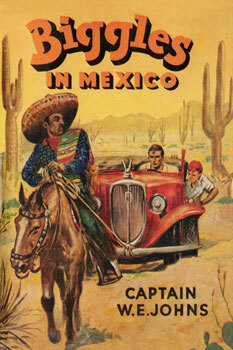 Johns in 1932, Biggles has become one of the most enduring figures in childrens fiction of the last century. From his creation in 1932 to the time of Johns death in June of 1968 he had written 96 Biggles books, and a couple of further books have been published since. Within this site you will find a list of all the Biggles books written by Johns along with publication details for the British editions. This site is aimed at both the collector and the reader and hopefully both will find it of use. April 9th 2019 Has it really been that long? I've started on some tidying up and fixes. The registration should now work again and I'm removing all the flash widgets as its now deader than two doornails. I'll update any fixes or quality of life changes that happen (if they do). January 18th 2016 There's been very few updates / new releases recently but The Works has 'Biggles Adventure Double' for £2 at the moment. Get one and get one for a friend. December 4th A large, impressive collection of Biggles books, articles and ephemera are going under the hammer at Southerbys on the 9th December. If you've got deep pockets it looks like some wonderful stuff is to be had. May 30th 2014 Some apologies. Sorry if you have sent me updates to the site and they are yet to appear, I'm in a middle of a house move and it's all been hectic. Also sorry if you had forgotten your password and found there was no way to retrieve it. I couldn't find the code anywhere so I think it might neve have been done. Oops. It's there now so will return your password by email when requested. March 26th 2014 If you are looking at getting your Biggles collection off the ground you can get 15 Red Fox editions for just £12.99 off The Book People (via Amazon) The books are previous editions and clearly being sold cheap as the new editions come out, but the price is good. Norman Wright has announced that his latest edition, Biggles Flies East is the last book to be published in his series. A huge thanks has to go out to Norman for providing us with such a quality run of the hard to find Biggles stories over the past 20 years. 20th November 2013 I have started to update publication information based on the latest research from Mr Nouwens. I will update listings as new information is supplied and will add the latest changes to the right hand menu on the front page. Once again thanks to Ian for the hard work which makes this site possible. September 11th 2013 - Red Fox are republishing at least 6 new paperback editions next year. Starting in January they will be releasing 2 every 2 months. 'Flies East' and 'Learns to Fly' arrive in January, 'Camels are Coming' and 'Of The (Camel) Fighter Squadron' in March and 'In France' and 'The Rescue Flight' in May. Others will no doubt follow. September 10th 2013 - Norman Wrights next publication will be a reprint of what is often considered one of John's best Biggles books 'Biggles Flies East'. It will feature the same wealth of extras as previous NW editions of the early books with a number of plates added reproducing early illustrations. The book is avaliable for pre-order from Norman now. I have been informed by two or three collectors that fake copies of the paperback first edition of 'Biggles Does Some Homework' are, from time to time, being offered for sale - usually via internet auction sites, at about half the 'going rate' of genuine copies. I have not actually seen one of these fake copies but from scans sent me by an unfortunate purchaser of one, is appears the fakes have covers copied from a genuine 1st edition but with the cover image trimmed closer to the edge, removing parts of the picture - thus Raymond is missing some fingers at the bottom, and part of the tree on the left hand side of the image is trimmed off. The big difference, however, is that on the fake copies the fraudster appears to have re-set the type and the word 'BIGGLES' on the title page is much narrower than on genuine copies. On a genuine copy the word 'BIGGLES' on the title page is as wide as the wording 'Does Some Homework' on the line beneath it. On the fake copies the word BIGGLES is about two letters narrower each side than this. I have also been told that the quality of the paper on the fake copies is inferior to the paper used for the genuine book. I have told the collectors concerned to inform the police - as this is most certainly fraud and whoever is producing and selling them needs to be brought to book. July 3rd 2013 'Indie Books' Worrals editions are now available to order via amazon. Click on the covers below to order. July 1st 2013 The Royal Airforce Museum will be hosting An Afternoon with Biggles on 27th of July. In what sounds like a fantastic event, there will be a talk on W.E.Johns and the comparison of his career with that of Biggles, and a tour of WWI aircraft. Details can be found on the RAF Museum site and the press release can be found here. Entry is £25 for non members but let them know Biggles Online sent you and take advantage of the 'Lightning' rate of £20. June 13th 2013 Indie Books with support from The RAF Museum in London are releasing a set of new editions of Worrals books. Worrals of W.A.A.F., Worrals Carries On and Worrals Flies Again will be avaliable in hardback for the first time in decades with brand new jackets and interior art. It looks like a retro, distressed feel will be used in a similar way to the Prion releases. The books will be avaliable to buy online and will cost £12 each. 15th May 2013 The long lost 1960's Granada TV series is finally coming to DVD. Amazon have preorders open for this 6 disk, 44 episode set. Starring Neville Whiting as Biggles and John Leyton as Ginger, this 'Algy-less' series retold a number of Johns books in episodic format. Update The release for the DVD has been pushed back to March 2014. March 17th 2013 Biggles and the Noble Lord is the latest release from Norman Wright. Norman is now accepting orders and the book is hoped to ship in April. 4th September 2012 Continuing his alternate publishing schedule of WW1/Later Air Police books, the next publication by Norman Wright is 'The Rescue Flight' one of the two complete WW1 stories (rather than short stories), this new release appears to have had the complete NW works with accompanying images from the original 'Modern Boy' publications and the Oxford frontis. 30th March 2012 Norman Wright has announced his latest release, which is Biggles Sees Too Much, the last Biggles completed book published. Ordering for the book is open and the book is expected to be ready for shipping within a week or so. Normans next release will be 'The Rescue Flight' and will include the 'Modern Boy' illustrations, in keeping with the series. 15th November 2011 A bit of a milestone reached. It's taken 3 years but all the imagery supplied by Mr. Ian Nouwens has been inputted into the site. A big thank you again to Ian for supplying the data. A divorce and several house moves prevented it getting done sooner. I am now going through my own collection adding to and improving images where possible, I'll then move onto illustrations hopefully. You might notice one or two improvements and changes to the site too. I'll be adding some new features when I can figure out how to structure them. As always if you see anything you can provide a better quality scan of or anything missing please don't hesitate to mail me. 2nd November 2011 In time for Christmas, Norman Wright has announced the 12th hardback edition in his reprint series. Biggles in the Underworld is the latest book to receive the collectors edition treatment. Unavailable in hardback for over 40 years, the book is now avaliable for pre-order from Mr Wright. 29th June 2011 Norman Wright has announced the next of his Collectors Editions. Not a rare book to find, but containing all the original Modern Boy and Boys Friend Library illustrations, it makes a valuable edition to his Collectors Series of books. This will be the second release of the year from Mr Wright, following on from his February release of Biggles and the Gun Runners. In other news I have fixed a number of small bugs on the site and images should be appearing in all places that images should be expected. I plan on making some more enhancements to the site soon, it's been too long neglected. I am going to start by attempting to complete the insertion of all the missing cover images yet to be processed. Thanks to the people who have mailed with support and with edition variation or clarifications. Your help is much appreciated. 19th November 2010 A long overdue update. Norman Wright has released a new hardback collectors edition of 'The Camels Are Coming'. Avaliable now, this is the first time this book has been published in hardback since 1938 so well worth looking out. In other news the registration system is now working thanks to a fixed CAPATCHA. Sorry about that. 19th May 2010 - Norman Wrights latest hardback is due to be shipping in a few weeks. Limited to 300 copies, they can be ordered directly through Norman as usual. In other news, real life has got in the way of me updating recently. The site is not dead, just resting a bit. Normal service will be resumed. 12th February 2010 Just noticed that a PHP upgrade had killed all the images on the site. Should all be back in their rightful place now. 3rd December 2009 - There is still time to pencil in some new presents on that christmas list, right ? Norman Wrights announced his next publication, which is 'Biggles Learns to Fly'. In a change to his usual releases, this book isn't a rare one, still being in print today. It does however have the original text and reproductions of the original images included. The book should be available late December / early January. 25thSeptember 2009 - Another compilation is on its way from Prion. Released on 1st October, Biggles' Secret Assignments contains Biggles' Second Case; Biggles Breaks The Silence; Biggles Gets His Men and Biggles Follows On. 4th August 2009 - I've added some new functionality for registered users. You can now select the editions that you own and view them in a list. I did it mainly for my own sake so I can remember what's in my collection when out and about, but I hope others find it useful. I intend to add further information in the future to allow the addition of notes ect. about your collection. Books added to your collection are strictly only viewable by yourself. 5th July 2009 - A new addition to the Norman Wright library has been announced. Continuing Normans work to provide new issues of the harder to find Biggles books, a new hardback edition of 'Biggles Scores a Bull' will be released in August. Copies are avaliable for pre-order from Norman as of now. In other news I am back to the task of adding the edition scans. I'm trying to set myself to add at least a couple of books a week. Also in response to a number of emails, I've added a page outlining what is needed off you if you have information about editions not listed. All additions and corrections are very much appreciated. 19th February 2009 - Norman Wright has announced his next release will be a hardback of 'Biggles In France'. First published in Boy's Friend magazine, 74 years ago, this will be the first time it has been published in a hard cover. Complete with the original illustrations from its first printing, the book will be avaliable from the middle of March. 28th August 2008 - Norman Wrights next publication will be a reprint of the hard to find 'Biggles Looks Back'. An important book character wise, this will be its first time back in print in over 40 years. The book should be available in the next 4-6 weeks. 8th August 2008 - Prion books have just released a second 'retro' style compilation of Biggles books. Biggles in Australia, Biggles Secret Agent, Sergent Bigglesworth CID and Biggles Air Commodore are all included in 'Biggles Dangerous Missions'. 19th June 2008 - Into the 30s now with the covers. I've had my first years renewal for the domain name so I've been a year on this site. I'll work harder. 12th March 2008 - The first 21 books now have images, still a way to go. Also Norman Wright has announced a new hardback copy of Biggles - Air Ace. Norman is currently accepting preorders of this edition, limited to 300 copies, for release in early April. 20th February 2008 - I am currently working on getting the covers and associated images up for all the books but only the first dozen or so have a complete overview. Biggles Looks Back Laminated edition.